Are you feeling inspired by this month’s adventure supplement? We’re all thinking intrepid thoughts here in the WOC office, and in this issue you’ll find reports by our explorers far and wide – from Alaska (by yours truly) to Vietnam, and from Myanmar to the Mississippi. And if you prefer your adventures closer to home, we feature an amazing river cruise that not only lets you spend three whole days in Venice but also takes you through some of the loveliest (and less visited) parts of Italy. If you’ve never cruised before, your first time will be an amazing adventure, wherever you go. To help you on your way we’ve put together our 25 top tips for beginners – and if there are any lingering doubts that you’ve made a great decision, turn to page 58 to read how a cruise sceptic fell in love with life on the ocean wave. Wherever you travel and however you cruise, we want to hear about it. 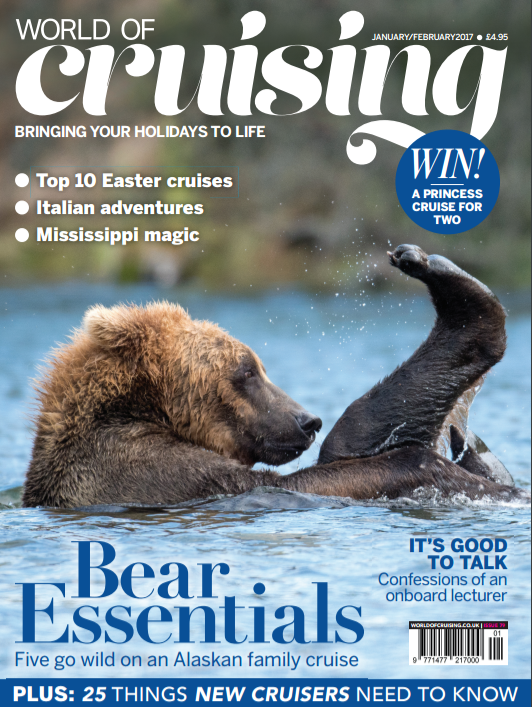 So send us an account of your holiday adventures, between 300 and 3,000 words, and you could win a love2shop voucher – and see your piece published on the World of Cruising website (for more details).